WHETHER YOUR LIFE INSURANCE POLICY IS ELIGIBLE FOR TAX SAVING? Every person has a tendency to save a part of their current income for their future needs. At first income comes in saving account of a person and then he decided to put this amount in other financial instrument (like PPF, Life insurance Policy, NSC etc.) or asset (land &Building) and this process is called investment. The investment decision is broadly depended on money inflows, Liquidity required, Goal to be achieved, time of money required and expected post tax return on investment. However when the investment are made to save income tax also then it is also called tax saving investments. As per Section 80C of Income tax act an individual or HUF (Hindu undivided Family) can avail a maximum deduction of Rs 150000 from gross taxable income by investing in tax saving instrument. The Popular tax saving instrument are Life insurance policy (Term plan, Money Back policy, Endowment plan, Unit linked plan etc) , Public provident fund , National saving certificate ,equity linked saving schemes. One can invest money in any of the eligible tax saving investment instrument /scheme according to their financial goal to be achieved. If you have selected Life insurance policy for tax saving investment, then you should take due care about the taxation benefit available on such policy at the time of investment and also at the time of maturity. Payment of Insurance policy premium is eligible for deduction to individual under Income tax act, if it is paid for Self, spouse or their children. Payment for insurance premium for father /mother /Brother/sister is not eligible for tax saving. The premium is eligible for deduction on payment basis only not on due basis. Suppose you have paid premium for two years in one year then it can’t be claimed on pro rata basis. As per Income tax act maximum deduction for Insurance premium is restricted to 10% of the sum assured. So, if you are planning to Invest in new insurance policy then you must at least take sum assured 10 times of the premium payable for insurance policy. Further Maturity amount of life insurance policy is tax exempted only if the sum assured is at least 10 times of the premium payable throughout the term of the insurance policy. 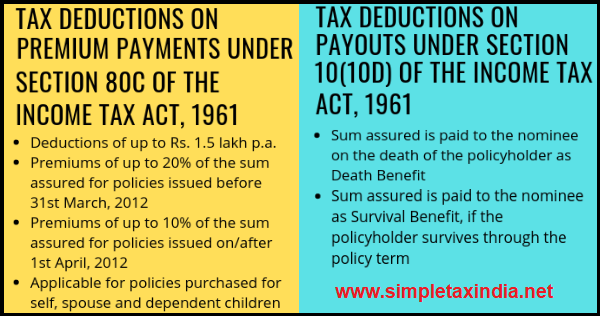 So, keep in mind that single term policies with inadequate sum assured shown as above are now not eligible for deduction u/s 80C as well as exemption from income tax at the time of maturity. Insurance Policies are most popular tax saving investments. Most of the insurance policies in India are sold in January, February and March Month at the end of the Financial year. In our view Tax saving should be one of the criteria and not the only criteria to take investment decision. Tax saving is only having an impact on your net rate of return from investment and One should not ignore other important factors and always keep main focus on achieving Overall Financial Goal(s). Sir, payment of premium by cash is it eligible for deduction under section 80C ? SIMPLE TAX INDIA: WHETHER YOUR LIFE INSURANCE POLICY IS ELIGIBLE FOR TAX SAVING?